If you are interested in adopting one of our dogs, please download, print and complete the adoption form then scan and email it to us at info@112carlotagalgos.com or please phone 659 00 61 07 for more information. For both the pdf and Word versions of the Adoption document you can also right click on the “here” link above, select “save target as” and save the form directly to your computer. *The form is an Adobe Acrobat pdf file and you need Adobe Reader to view it. 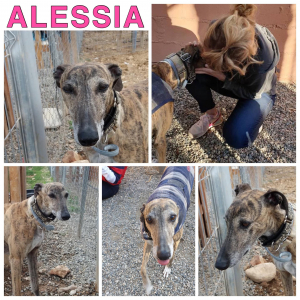 Alessia is a sweet natured beautiful brindle girl who is obedient, confidant and balanced. Alessia is happy, very affectionate, loving and is not afraid of anything. 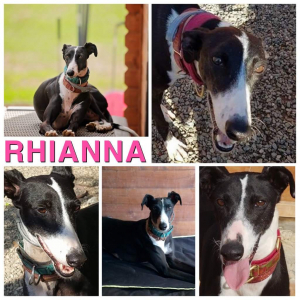 She would make a great companion as she loves people and other dogs. She is so ready for her forever and to give her adopters loads of cuddles. 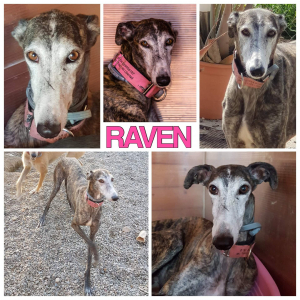 RAVEN is now looking for his special forever. He still holds a timidness but he can face the world now with his head held high. He jumps around like a gazelle and is starting to shine. He will need a very special home who will continue to not let him live in fear and go backwards but forwards to carry on loving life. This is a champion who I truly thank for having had faith in me to take him from the depths of despair to the happiness he feels today. 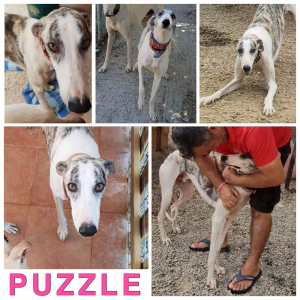 Rescued with 40 plus galgos from an abandoned pig farm he arrived with 6 galgos. Totally wild and spent. Living on the edge of time. In wild pack life. To date he’s the second of the 6 to be ready for adoption. He is cheeky. Playful. But will retreat a little if worried. He’s learning new life. And doing so well and would just love a home to go to. Jedi’s daughter also. Again an absolute broken trauma case. And to date she actually still can be rejective. Katerina who within the 2 was far worse has blossomed and while Eloisa has also theres still caution across her mind. She also when going to bathroom duties does this standing up and not crouching. This is a sign of the past where nerves are damaged. Most likely from one of the blows received. Id love the girls to find a home together. And miracles do happen. 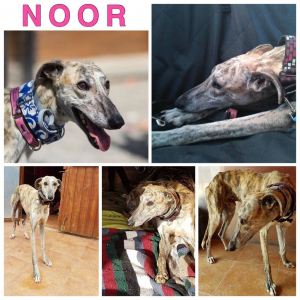 Noor is a stunningly handsome shy, big boy. While the name Noor may sound like it is dark. Night. It actually means “Light” and while this boy has lived in the dark he has come into the light. It is simply just by chance, simply by crossing the path of Maria Torres and then into our rescue. He would love a home that lets his playfulness shine, like it does here one of patience and understanding. Nice walks and love. Rhianna came to us a broken angry girl. Biting at every chance she got. 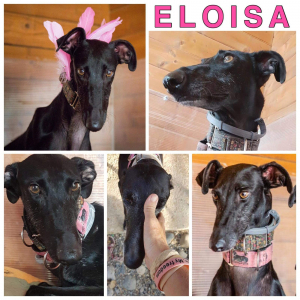 Shes a delicate girl who needs a very patient experianced home. Her issues of biting have subsided and she trusts us but she will always have fears where new people are concerned. Shes a special case. Special galga. Who needs a special home. 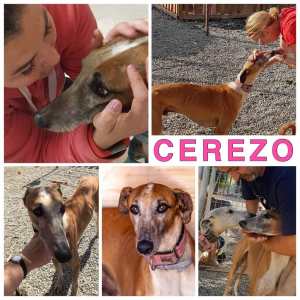 Cerezo is a boy whose markings are beautiful, and he’s just learning to cope with life away from a galgueros side. He’s adapting well, friendly but submissive. Still to gain more confidence but he’s really trying. A real angelic boy who’s ready to go home.